John Doulton, born in London on 17th November 1793, was made an apprentice at the Fulham Pottery in 1805 and completed his apprenticeship in 1812. Doulton then found employment as a thrower at a small pottery in Vauxhall Walk, owned, following the death of her husband, by a Mrs Martha Jones. NOTICE is hereby given that the Partnership between Martha Jones, John Watts and John Doulton of Vauxhall-Walk, in the County of Surrey, Potters, and carried on under the firm of Jones, Watts and Doulton, is this day dissolved by mutual consent; and that the debts due from the said Co-partnership will be paid by the said John Watts and John Doulton, the continuing Partners to whom all debts due to the said Partnership are to be paid. The business, now known as Doulton & Watts, moved to Lambeth High Street in 1826 and continued to develop its main business of stoneware bottle manufacture. John Doulton (Jnr) (b. 1819) and Henry Doulton (b.1820) joined their father in the successful family business. In 1846 Henry Doulton established a separate business to manufacture sanitary ware and earthenware pipes. Unable to find all of the capital required, Henry turned to his father and the business was established at 63 High St, Lambeth, adjacent to Doulton & Watts, with Henry Doulton, John Doulton (Snr) and younger son Frederick Doulton as the partners. Such was the demand for sanitary ware that within a few years Henry Doulton & Co. had established pipe-making factories in the English Midlands at Dudley, Smethwick and Rowley Regis. John Doulton (Jnr) also started an independent business (in 1947), establishing a pipe-making factory at St Helens in Lancashire to supply pipes to Liverpool and the north-west. At the end of 1853 John Watts retired, triggering the liquidation of his partnership with John Doulton. He was well rewarded, receiving his share of the partnership as an annuity of £150 per annum and interest at 5% on a sum of £5000. *The figures, above, are from the book by Desmond Eyles: Royal Doulton 1815-1865 – The Rise and Expansion of the Royal Doulton Potteries. Hutchinson of London (1965). Henry Doulton’s vision to invest in pipe manufacture was thus truly vindicated as the value of Henry Doulton & Co., in only six years, had increased from the initial £1,400 invested by the three partners to over £33,000, and contributing to the new business over three times the value of Doulton & Watts the long established family business. Shareholders in Doulton & Co. were Henry Doulton (47/125th), John Doulton (Snr) (42/125th), John Doulton (Jnr) (23/125th), Frederick Doulton (12/125th), and Alfred Doulton (1/125th). Only two years into the new partnership Alfred Doulton died whilst returning from a visit to Australia, John Doulton (II) died in 1862 and when Frederick Doulton retired from the business to enter politics, the partnership was reconstituted from 1st January 1864 with the partners being Henry Doulton (14/25th), John Doulton (I) (10/25th), and James Duneau Doulton (1/25th). James (b. 1835) was the youngest son of John Doulton (I) and was to become the administrative manager of the Doulton businesses. Henry Lewis Doulton, Henry Doulton’s only son entered the business in November 1872, and when John Doulton (I) died in 1873 a new partnership was required. This was formed from January 1881 when Lewis Doulton entered the partnership and Henry Doulton transferred one quarter of his capital to his son. The value of the business had increased to £290,192, and the new partners were Henry Doulton (54/100th), James Doulton (27/100th), and Henry Lewis Doulton (18/100th). James Doulton died in 1889, and Sir Henry Doulton in November 1897, however, the business continued under the leadership of his son Henry Lewis Doulton and nephew Ronald Duneau Doulton. The business was incorporated in 1899 as Doulton & Co. Ltd with Henry Lewis Doulton as both the Chairman and first Managing Director. The other founding Directors were his cousin Ronald Duneau Doulton (who had replaced James Doulton as the principal administrator of the Doulton businesses), Benjamin Hannen, a well known master-builder, and William Turnbull, principal of the china merchants Turnbull, Lachlan & Co. The capital of Doulton & Co. Ltd was established as £1,100,000, constituted as 400,000 ordinary £1 shares, £350,000 in 5% preference shares, and £350,000 in 4% irredeemable debenture stock. As the vendor of Doulton & Co., Lewis Doulton took all of the ordinary shares and one-third of both the preference and debenture stock in the new company. The balance of the preference shares and debenture stock were offered to the public. Doulton was granted a Royal Warrant and right to use ‘Royal’ in the name of its products by King Edward VII in 1901. Henry Lewis Doulton remained as Managing Director until 1918 and as Chairman until 1925. Having no children, Lewis Doulton looked to his nephew, Lewis John Eric Hooper to continue the family connection with the business. Eric Hooper, who trained first as a lawyer, had entered the business in 1902 and was appointed to the Board as a Director in 1909. He succeeded his uncle both as Managing Director (in 1918), and as Chairman in 1925. Eric Hooper remained as Chairman until his death in 1955 and was succeeded by E. Basil Green who had been Joint Managing Director (1947-1950) and then sole Managing Director until his appointment as Chairman in 1955. In January 1956 Doulton & Co. Ltd reorganised its operations into four subsidiary companies, manufacturing respectively, sanitary wares, industrial porcelains, drainage pipes, and earthenware and fine china. The latter, the non-industrial ceramics business, became the responsibility of the new subsidiary company 'Doulton Fine China Ltd' registered in October 1955. Basil Green remained Chairman of Doulton & Co. Ltd until the end of 1963 and was succeeded by Mr. J. Kenneth Warrington, a former manager at Nile St, Burslem and, at the time, the Managing Director of Doulton Fine China Ltd.
Doulton & Co. Ltd (and its many subsidiaries) was acquired by S. Pearson & Co. Ltd in November 1971, however, Doulton & Co. Ltd continued to operate as the holding company for the Pearson Group's ceramics interests until the float of Royal Doulton plc in 1993. See also: The Doulton family for more information on the role of Sir Henry Doulton’s descendants in the management of the business including a list of family Partnerships/Directors, and a family tree. Doulton & Co. was first and foremost a manufacturer of industrial ceramics, including water filters, drainage pipes and sanitary fittings. In the early 1860s, however, the company began the manufacture of domestic and ornamental salt glazed stoneware that became known as 'Doulton Ware'. The nearby Lambeth School of Art became associated with the Doulton business from about the same time and Henry Doulton joined the Board of the School in 1863. Doulton & Co.'s decorative stoneware produced in association with the School of Art had enormous success at International Exhibitions in the 1860s and 1870s, culminating in acclaim at the Philadelphia Exhibition in 1886 (and also at Chicago in 1893). Public interest, and production, peaked in the late 1890s when about 370 artists were employed at Lambeth making the salt-glazed ornamental stoneware. With the death of Queen Victoria in 1901 and changing social tastes, the demand for the intricately ornamented stoneware declined so that by 1914 less than 100 artists were still employed. Following the end of the First World War, Lambeth produced stoneware reflecting more contemporary tastes, but by 1920 artist numbers had declined to only 30 – although small quantities continued to be made up to, and throughout (for export only), the Second World War. Production continued on a small scale from the end of the war, and in 1952 the artist and potter Agnete Hoy joined Doulton, designing both individual pieces and limited edition works. She combined her unique style with the traditional Lambeth decorating techniques for a last flowering of the Lambeth stoneware tradition. Hoy’s design studio and the Lambeth works closed in 1956. Lambeth remained the headquarters of Doulton & Co. Ltd until 1971 and the buildings were demolished in 1976. The Lambeth stoneware is exceptionally diverse and highly collectible and there are many specialist texts devoted to the story of Lambeth and its potter-artists. In 1974, Doulton introduced 'Lambeth Stoneware' as a casual tableware brand in an oven and freezer proof stoneware body. In 1877 or 1878, Henry and James Doulton purchased an interest in Pinder, Bourne & Co., manufacturers of domestic earthenware, sanitary fittings and electrical insulators at Nile St, Burslem. Doulton had bought sanitary ware from the Burslem firm and the investment, of £12,000, followed an approach from Shadford Pinder, the principle of the business. Speculatively, Pinder was probably concerned to improve the quality of his domestic earthenware, while the business’ sanitary and industrial ware would have been of interest to the Doultons. The investment established Henry Doulton as an earthenware manufacturer in the North Staffordshire potteries. Shadforth Pinder continued as the principal of the business, however, the partnership was not a success and in 1882 Pinder accepted a settlement and retired. The business was then reconstituted under the name Doulton & Co., Burslem with Henry and James Doulton as the joint owners (Henry Lewis Doulton was to join his father and uncle as a partner in 1884). Although Pinder had departed he left able employees. Henry Doulton confirmed the appointment of John Slater as the art director, and made John Cuthbert Bailey the manager of the Nile St factory. Bailey, only 23 at the time, was an inspired appointment and was to work for the company for the whole of his long working life. Under the management of Bailey and Slater, the Nile St factory grew to match and even exceed the achievements of Lambeth. Bone china manufacture was commenced in 1884 and under the direction of Slater a team of talented artists was was to produce the Doulton Burslem vases and ornamental porcelains that rival the products of Worcester, Minton and Derby. Charles J. Noke, trained at Worcester under the artist Charles Binns, was employed as a modeller and decorator at Burslem in 1889, eventually to succeed John Slater as art director in 1914. Expansion of the Nile St factory commenced in 1884-85 with the building of a bone china factory, in 1887 an adjoining works in Sylvester St was acquired, and in 1889 and 1907 the works were further expanded to cope with demand. Whieldon Sanitary Potteries Ltd, formerly F. Winkle & Co. Ltd, was acquired in 1937 allowing sanitary and industrial ceramic manufacture to be transferred from Nile St allowing the expansion of fine earthenware and bone china production. Nile St continued in full production (for export) throughout the Second World War, and further expansion of the factory took place following the end of the war. In 1956, the Doulton & Co. Burslem operations became the core of the new company Doulton Fine China Ltd. 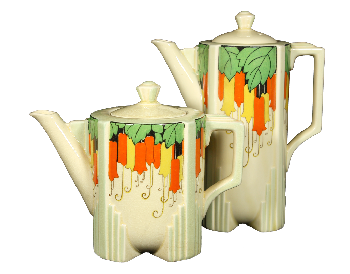 In January 1956 Doulton reorganised its operations into four subsidiaries, manufacturing sanitary ware, industrial porcelain (electrical insulators, laboratory porcelain etc), drainage pipes, and earthenware and fine china. The latter, the non-industrial ceramics business, became the responsibility of a new subsidiary company 'Doulton Fine China Ltd' registered in October 1955. The main products of the company were tableware, figurines and character jugs marketed under the Royal Doulton name. Doulton was at the forefront of the consolidation of the UK ceramics industry during the 1960s taking over the businesses of Mintons Ltd and Dunn Bennett & Co. Ltd in 1968, and Webb Corbett Ltd (glass) and John Beswick Ltd in 1969. In November 1971 S. Pearson & Son Ltd, a member of the Pearson Group, and already owner of Allied English Potteries Ltd, acquired Doulton & Co. Ltd, merging the two groups under the Doulton name. Allied English Potteries Ltd was renamed Royal Doulton Tableware Ltd and became a subsidiary of Doulton & Co. Ltd responsible for the tableware and giftware businesses of both groups. Doulton & Co. Ltd continued to operate as the holding company for Pearson's ceramics interests until the float of Royal Doulton plc in 1993. Following the merger with Allied English Potteries Ltd in November 1971 the Doulton Fine China Ltd business became part of Royal Doulton Tableware Ltd. Use of the Doulton Fine China Ltd name continued, however, until circa 1973. ‘Allied English Potteries will become a subsidiary of Doulton and its name will be changed to Royal Doulton Tableware Ltd’. From January 1973 Royal Doulton Tableware Ltd became custodian of the tableware and giftware assets of the two groups including the Royal Doulton, Minton, Beswick, Dunn Bennett, Booths, Colclough, Royal Albert, Royal Crown Derby, Paragon, Ridgway, Queen Anne, Royal Adderley and Royal Adderley Floral names, and their vast manufacturing operations. The company also held the 50 Lawleys china and glass retail stores inherited from Allied English Potteries. Royal Doulton Tableware Ltd was a subsidiary of Doulton & Co. Ltd, itself a subsidiary of the Pearson Group. The name was in use until at least 1983 and probably until the float of Royal Doulton plc in 1993. See the entries for the individual companies for further details. The tableware manufacturing interests of Pearson plc (S. Pearson & Son Ltd pre-1984) trading under the Royal Doulton name were floated on the London Stock Exchange in December 1993 as part of a rationalisation of the Pearson Group's industrial interests. The new, independent company was named ‘Royal Doulton plc’. The new public company, Royal Doulton plc acquired Holland Studio Craft, a maker of resin sculptures, and art glass maker Caithness Glass in 1996. However, despite these acquisitions, Royal Doulton made substantial losses in 1997, 1998 and 1999 leading to the sale of Royal Crown Derby Ltd to a management-led group in early 2000, and the sale of Caithness Glass to Royal Worcester Spode Ltd in 2001. Despite substantial rationalisation, losses continued and in March 2002 Doulton announced the closure of its historic Baddeley Green factory and the transfer of production of ‘Royal Albert’ to Indonesia. The closure of the Beswick Gold St Works in Longton was announced in September 2002 and both the Baddeley Green and Gold St factories ceased production in December 2002. In March 2004 the company announced that its only remaining UK factory, the famous Nile St premises in Burslem, would also close. Waterford Wedgwood who had purchased 15% of Doulton's shares in 1999 increased its stake to 21% in 2002 and completed a £39.9 million takeover of Royal Doulton plc in February 2005. On the 15th April 2005 production at the historic Nile Street site ceased and production of the Royal Doulton, Minton and Royal Albert brands was transferred to factories of the Waterford Wedgwood group. See the Royal Doulton timeline for chronological view of the company’s history. Betteridge, M. (1979). Royal Doulton Exhibition 1979. Museum of Applied Arts & Sciences, Sydney. Eyles, D. (1953). Royal Doulton Potteries (Ceramics in art and industry. Doulton & Co. Ltd.
Eyles, D. (1965). Royal Doulton 1815-1865 – The Rise and Expansion of the Royal Doulton Potteries. Hutchinson of London. Eyles, D. (1979). The Royal Doulton Character and Toby Jugs. Royal Doulton Tableware Ltd. ISBN 0906262011. Eyles, D. (1980). The Doulton Burslem Wares. Barrie & Jenkins, London. Eyles, D. (1983). The Story of Royal Doulton. Royal Doulton. Eyles, D. (1994). Royal Doulton Figures: Produced at Burslem 1890-1978. Antique Collectors Club Ltd. ISBN 0903685353. Eyles, D. (2002). The Doulton Lambeth Wares. Richard Dennis. Irvine, L. (1980). Doulton Series Ware Vol. 1: Subjects from Literature, Popular Illustrators, Historical Characters and Events. Richard Dennis Publications. ISBN 0903685078. Irvine, L. (1984). Doulton Series Ware Vol. 2: Olde Worlde Imagery. Richard Dennis Publications, London. ISBN 0903685140. Irvine, L. (1986). Doulton Series Ware Vol. 3: Doulton in the Nursery. Richard Dennis Publications, London. ISBN 0903685175. Irvine, L. (1988). Doulton Series Ware Vol. 4: Around the World Flora and Fauna. Richard Dennis Publications, London. ISBN 0903685213. Irvine, L. (2007). Doulton Series Ware Vol. 5: New Discoveries. Richard Dennis Publications, London. ISBN 0903685728. Lukins, J. (1981). Doulton Flambe Animals. Venta Books. ISBN-10 0907405010. Lukins, J. (1981). Doulton Kingsware Whisky Flasks. Venta Books. ISBN-10 0907405002. Lukins, J. (1985).Doulton Burslem Advertising Wares: A Record of the First 100 Years. Venta Books. I ISBN 0951028812. Lukins, J. (1985).Doulton Lambeth Advertising Wares: 1815-1956. Venta Books. ISBN-10 0951028847. Lukins, J. (1989). Collecting Royal Doulton character and Toby jugs 1934-1989: a record of the first fifty-five years. Venta Books. ISBN 0951028820. Lukins, J. (1990). Doulton for the Collector (revised 2nd edition). Venta Books. ISBN-10 0951028863. Lukins, J. (1991). Collecting Doulton Animals. Venta Books. ISBN-10: 0951028839. Lukins, J. (1992). Collecting Doulton Kingsware. Venta Books. ISBN-10 0951028855. Lukins, J. (1994). Collecting Royal Doulton Character and Toby Jugs. Venta Books. ISBN 0951028871. McKeown, J. (1997). Royal Doulton. Shire Books. ISBN 0747803382. Pearson, K. (1986). The Doulton figure collectors handbook. Kevin Francis Publishing. ISBN 0951076817. Pinchin, D. (1996). The Doulton figure collectors handbook. Francis Joseph. ISBN 1870703413. Queree, J. (1993). Royal Doulton. Hale, London. These are current (2011) Doulton websites and reflect Doulton brand positioning post-the sale of Waterford Wedgwood to new owners in early-2009. A private site developed by Daniel Doulton, a member of the Doulton family. Contains links to the history of the Doulton businesses. A guide to the secondary market price of Doulton’s character and Toby jugs. There is also a book/price guide available through the site: A Century of Royal Doulton Character & Toby Jugs by Stephen Mullins, David Fastenau and Louise Irvine. A private site selling antique-quality Doulton Lambeth and Doulton Burslem ware. From mid-2011 this web site replaces the printed Collecting Doulton & Beswick magazine edited by Barry Hill and Jocelyn Lukins. It is an independent and authoritative source of information for collectors of Royal Doulton and Beswick. 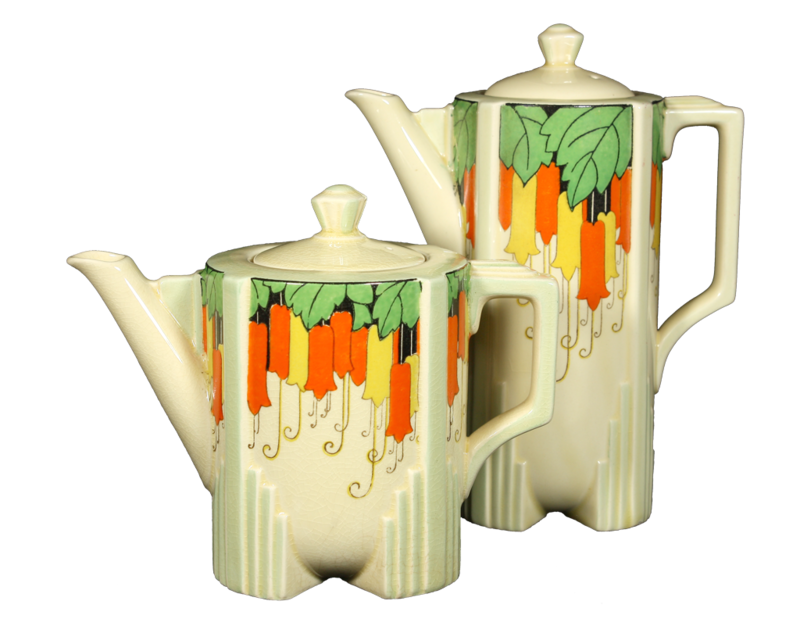 The site carries articles, diary dates, letters, small advertisements, auction reports and other Beswick and Doulton news. It is currently free, but may introduce a small subscription to access in-depth articles and archives. Other URLs redirecting to this site include royaldoultonassociation.com, royaldoultonnews.com, royaldoultonantiques.com, royaldoultonblog.com, royaldoultonsalesdepot.com. The official Doulton International Collectors Club was dissolved in 2008. Make your own judgement on the value of these sites. Doulton’s ‘Pillar’ shape from the 1930s exhibits art deco influence in the straight lines and stepped feet. The pattern is ‘Maybells D5202 (1932).